Youth in rural East Africa have few opportunities to develop the soft and technical skills that can help them to build successful businesses and break the cycle of poverty in their communities. TechnoServe's STRYDE program uses an integrated youth training curriculum that has help rural youth like Prisca Cherono to unleash their full potential and increase their incomes by an average of 133 percent. As a single mother of two with little formal education, Prisca Cherono couldn’t find any viable employment opportunities in Eldoret, Kenya. So she pursued the only path she thought was open to her: domestic help. “I had resigned myself to do this until I die because I saw no other way out,” Prisca said. When Prisca’s friends told her about TechnoServe’s STRYDE (or Strengthening Rural Youth Development through Enterprise) program in 2016, she registered immediately. “I had a feeling that one way or another, STRYDE was going to be my last chance to get out of this vicious cycle of menial jobs.” Each morning during the three-month training, Prisca would get her 6-year-old ready for school, find a quick cleaning job, then bring her toddler son to training. Participatory sessions about personal effectiveness helped Prisca identify her strengths and weaknesses and provided coaching on communication, negotiation and critical thinking – important soft skills that few rural youth in East Africa have the opportunity to develop. She also learned the ins and outs of entrepreneurship: how to conduct market research, establish prices, calculate profits and so on. After graduation, Prisca opened a hair salon. Using some savings and a small grant from a technical assistance fund, she rented a space and bought basic salon equipment. Today she’s earning 80 percent more than she did as a domestic worker – and she sees herself in a new light. “I can now feed and educate my children comfortably while running my own business,” Prisca said. Prisca’s story resonates throughout East Africa, where TechnoServe runs the STRYDE program in partnership with The MasterCard Foundation. With the global youth unemployment rate on the rise and 11 million young Africans entering the job market annually, helping youth tap into their tremendous potential to become agents of change is critical to economic growth and stability. That is why TechnoServe is committed to empowering youth who are productively engaged in the economy and are socially active leaders in their communities. 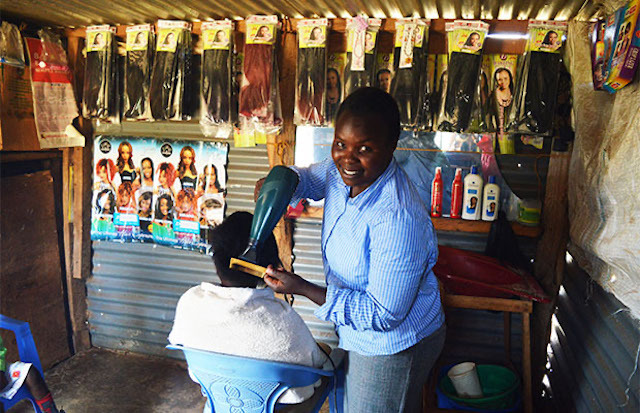 Since 2011, STRYDE has provided training to more than 35,300 rural youth in Kenya, Uganda, Rwanda and Tanzania, helping participants increase their income by an average of 133 percent. Like Prisca, more than 49 percent of STRYDE’s participants are young women, who play a critical role in transforming the economic status of their households. a budget and writing a business plan, are layered on top of this foundation, along with gendersensitivity training. Upon graduating, about 15 percent of STRYDE participants find casual employment, while the majority start their own businesses, including agribusinesses. STRYDE business counselors provide nine months of customized support to the new entrepreneurs to ensure success. TechnoServe is replicating this tested methodology and adapting it to youth projects across the world.